The music business in the 21st century is alive and well with hundreds of growth professions related to audio recording, sound engineering, music production, commercial music, and a wide variety of music industry jobs. 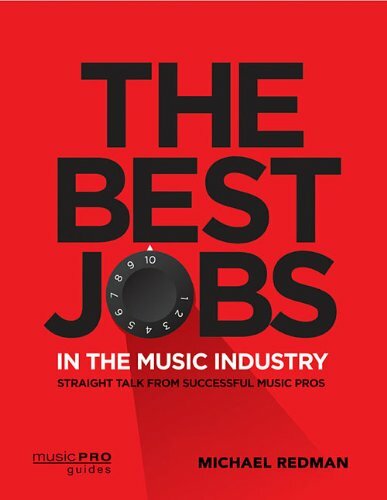 Here is an overview of the wide categories of music industry jobs, from production to management -- which can be a great place for musicians and music school graduates all over the world to find a great career. Many trained musicians may not realize that having a career in music doesn’t mean just deciding between performance or music education. There are literally thousands of other choices and opportunities in the music business that could warrant further investigation. Every song, album, CD, movie score, TV show or commercial, and video gaming soundtrack that involves live musicians had a recording session of some kind -- often several to generate the final product you hear and enjoy. Whether it’s tracking guitar and vocals, or an entire symphony orchestra, recording engineers - also called sound/audio engineers - are responsible for capturing the musicians’ performances in true-to-life sonics. It is an amazing craft and art form... this art of capturing a vocal with just the perfect amount of breathiness and combining it with a Zen-like smattering of analog or digital effects. You can think of a sound professional with great musical instincts and total control over tracking, mixing, and DSP (digital signal processing) -- including effects like reverb, delay, chorus, and so much more. Imagine the skills it takes to get the perfect snare drum and kick drum sound to mix together into a perfect drum kit mix -- often sixteen or more tracks just for drums on many singles! Never underestimate the set of ears, with great miking techniques, that captures the perfect warmth of an acoustic piano -- shading every nuance with perfect EQ, and finds the right volume levels so it’s neither buried nor too exposed. The engineers at recording sessions are as critical as a court stenographer AND a judge in capturing every important sound, riff, take and then helping create a finished product through careful mixing, DSP work, great decision-making, and more. And that’s just for music... Repeat this same process with sound effects, foley artists, dialogue, voice-overs, and more. Often times the producer of a recording session can also be the lead recording engineer. So they start with the ears and the complete set of skills above, or perhaps they are a recording artist or musician first. But if not, they interface seamlessly with the engineers to create a perfect representation, or assembly, of the project as they imagine it. A producer, or record producer (even though we’re talking CDs and mp3s) helps the artist/band achieve a musical high point through a careful balance of encouragement, nudging, enabling, visionary work, leading questions, support, devil’s advocate, or whatever is necessary for the project. What’s also included in the role of a music producer is to create a musical reality that perhaps the recording artist cannot even imagine - especially when it comes to the development of new talent. A producer can hear what would work often without trying it, and aims to showcase their artist in the best possible light... all this while getting the CD completed, under budget -- discussing EQ, panning, reverb plug-ins, and other necessary studio jargon with the engineer. Other than music recording and production jobs, the music business is filled with a number of various creative and administrative jobs related to the artists, the songs, the recordings/CDs, the publishing rights, the broadcast rights, the clubs/venues, touring, and more. The CD & Record/Labels: At every level there are executives and management -- but there will always be A&R staff - essentially talent scouts who find the next Nicki Minaj or Dave Matthews, or your favorite artist. Often the music producers above are staff producers for the labels. There are also jobs here dealing with rights clearances, performing rights society paperwork (ASCAP, BMI, SESAC), and licensing (imagine your song in a hit movie!). The actual sales of physical CDs used to be the core of this business, so it included interfacing with the major worldwide music distributors. This manufacturing/distribution model still exists, but with iTunes, Amazon, and other downloading music platforms as the principal sales portals, digital copies/digital downloads are the main way they sell music now. There are extensive marketing and promotion jobs here as well. The Artist: A pop, rock, country, rap, or R&B star - after they elevate above the garage-band phase - needs people around him/her to manage their day to day appearances, travel, logistics (concerts, hotel/travel, press junkets), their finances, their bookings/gigs/concerts and more. Depending on how busy the artist is these jobs can be filled by several people: artist manager, press agent, booking agent, tour manager, accountants, entertainment lawyers, and more. In addition for recording artists who make ‘studio albums’, there are often needs for a touring band -- with a music director -- plus guitar/drum/keyboard technicians as well. In addition, many modern tours require elaborate logistics so it’s not uncommon to also employ lighting designers, back-up singers, dancers, a staff choreographer, tour concept designer, wardrobe and costume staff, hair and makeup personnel, drivers, techies, and often a touring chef or caterer. The Songs/Content/Publishing/Radio: The intellectual property rights of the songs themselves are the other lifeblood of the music industry. There is an intricate web of rights, publishing administration, performing rights society controls, music licensing jobs (film/TV/gaming), and other aspects of this component that provide thousands of jobs in the big markets of New York, Los Angeles, Nashville, London, Paris, Tokyo, Berlin, Shanghai, and Rio. Think of all the music on all the network, cable, and local channels on cable and satellite TV and you begin to imagine the scope of this market. The Clubs/Venues/Concert Halls/Stadiums: From booking, ticketing, marketing, promotion, live concert production (including live sound, lights, effects, rigging) and more, there are a number of music industry jobs related to the tours and live concerts that millions of fans attend each year by artists in every conceivable genre. There are a number of promotion, marketing, and management jobs available in this area as well. Whether you study music, music production, music business, or audio/sound engineering on-campus or online, there are many opportunities for trained professionals in this expanding and evolving field. Next time you go to a show, or a live concert take a look around at all the employees who work in the various rewarding aspects of the music business. That could be your career! If you're looking for a great job in the music industry, you can start right here.